"it would show America what the face of a traitor looks like..."
Why dont you save us all some time and post your mug homie? Why? 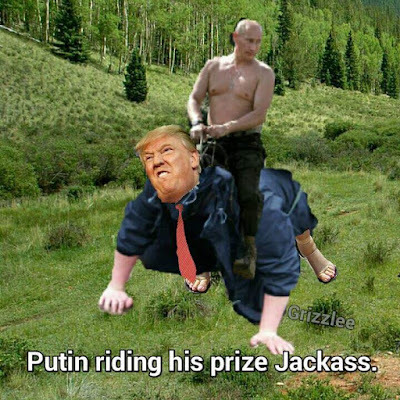 I'm not the one getting on my knees for Putin. Whoever you are getting down on your knees for is really not anyone else on the forums business Tready. Unless its someone on the forum in which case that's really just between you and them. Rummy is having trouble understanding English again. Mad Dog 20/20 will do that to you. I haven't ever drunk any Mad Dog 20/20. You drink it a lot so you know this huh? How often Tready has been down on his knees really isn't anyone's business except his and the other people he is down on his knees for Pete. "Do you swear to tell the truth, the whole truth, and nothing but the truth ?" The shaved apes will surely agree. President Donald Trump's lawyer Rudy Giuliani on Sunday claimed "truth isn't truth" when trying to explain why the president should not testify for special counsel Robert Mueller for fear of being trapped into a lie that could lead to a perjury charge. Giuliani‘s remark was not the first time he has gone down this road. A good example of Todd taking the remark out of context and Guilianni being very imprecise in his language.